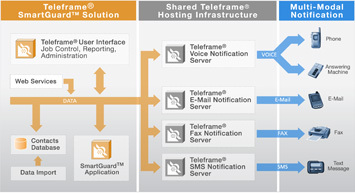 Teleframe® SmartGuard™ is a network-based watchdog monitoring service that utilizes our advanced hosting infrastructure to enable any organization to integrate event notification triggers into their applications for a fraction of the cost of what it would take to build and maintain internally. 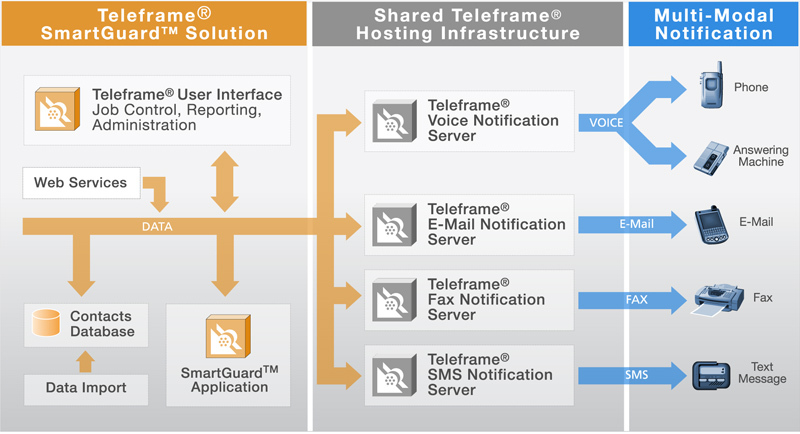 SmartGuard™ enables users to setup and maintain remote monitoring and notification scenarios quickly and easily. A web services interface makes it easy to incorporate advanced notification and alert functionality into any application or system process without having to buy or maintain costly hardware. SmartGuard™ can be configured to send alert notifications using voice messages, pagers, fax, SMS text, and e-mail. Messages can be sent to one or more locations as needed with full support for contact lists, alternate numbers, and advanced "follow-me" scenarios. SmartGuard™ speeds up and automates the contact process replacing other more traditional means of broadcasting information. Incorporate SmartGuard™ into your mission critical business applications and processes to be sure you get notified when you absolutely need to know what is going on.